Without being loaded with a lot of costly, unnecessary "features", the Bookeye ® 4 V2 Basic is still a full-fledged book scanner or book copier, ready for use anywhere where grayscale is enough. 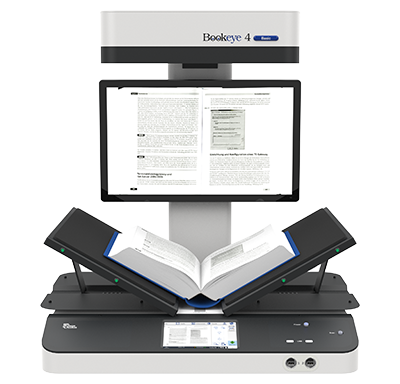 Equipped with a standard scanning application, Bookeye® 4 V2 Basic scans documents, such as magazines, files, folders, bound documents, contracts, and accounting ledgers at a resolution of 400 dpi at high speeds. The clearly structured menus on the touchscreen guide the user intuitively through the operation of the scanner. Scanned images can be stored directly on the device to a USB flash drive or sent via eMail. Uploads to an FTP server, printing to any network or connected printer and saving the images to network drives are also standard Bookeye® 4 V2 Basic functions. If scanner requirements become more demanding over time, the Bookeye® 4 V2 Basic can be quickly and easily upgraded. This protects your investment while allowing you to add functionality, like software options or interfacing with BatchScanWizard or other capturing clients.